Operator activity in the M2M market continues to hot up. This week Telstra has announced a new focus on M2M with an updated strategy and offering. Globally we are seeing many operators start to head down this path and we believe this will lead to benfits to our developer customers with better tariffs, more focus on M2M market requirements, and ultimately more sales. Telstra launched its 42 Mbps mobile broadband service using HSPA+ late late month. Sierra Wireless is the first to support Telstra’s 42Mbps Next G broadband with its first dual carrier module, the AirPrine MC8801, which is featured in this newsletter and for which samples will be available in October. If you would like further information on any item in this newsletter please contact us. The Sierra Wireless AirPrime MC8801 embedded module supports HSPA+ dual channel networks enabling speeds up to 42Mbps on the downlink. The MC8801 provides UMTS/HSPA and quad-band GSM/GPRS/EDGE network access to enable roaming on high-speed networks around the world. The MC8801 incorporates in-built GPS for applications targeting location-based services. Built to PCI Express mini card form factor, the MC8801 is ideal for networking OEM devices and applications including video streaming, security, consumer broadband, industrial routers and embedded computing applications. 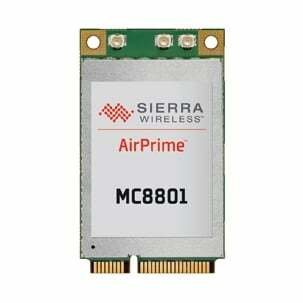 For more information on the Sierra Wireless AirPrime MC8801 please click here. The Maxtena M1621HCT quadrifilar antenna for Iridium Band & GPS uses advanced HeliCore™ Technology with measured peak GPS gain of approximately -4db at GPS and +2 at Iridium with a single feed point. In the World’s lightest form factor (9 grams) and very small size 48mm (height) x 18mm (diameter), this Iridium antenna is perfect for mobile handset applications (commercial or military). Maxtena plans to create a evaluation board which takes the dual Iridium and GPS signals and combines it into one. The next generation Q9602 iridium modem has a single output signal for both Iridium and gps is available. For information on the Maxtena M1621HCT quadrifilar antenna please click here. The RC1140 M-Bus RF Transceiver Module is a compact surface-mounted high performance module with embedded Wireless Meter-Bus (M-Bus) protocol for wireless Automatic Meter Reading (AMR)/ Advanced Metering Infrastructure (AMI). The Wireless M-Bus module works on the 433 MHz frequency band, but using the link and application layer of EN 13757-4. The module has a UART interface for serial communication and configuration and a one-pin antenna connection. 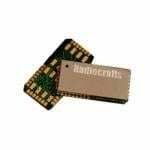 The Radiocrafts RC1140 M-Bus IESM Expansion card offers 433MHz for the Sierra Wireless Fastrack Xtend modem effectively turning the Fastrack Xtend into a M-Bus gateway. For more information on Radiocrafts’ M-Bus products please click here. The OEM SERIAL PORT ADAPTER™ 411 series is a Bluetooth module with support for the Serial Port Profile (SPP) for fast and secure transparent serial data transmissions. The module has a small form factor and low build height, and supports the Bluetooth 2.1+EDR standard for enhanced data rates (Bluetooth 3.0 prepared via firmware upgrade). As the Bluetooth stack is embedded in the module, it does not require any driver or stack in your host so that you can be up and running in the shortest possible time. The OBS411 is available now. For more information on the connectBlue OBS411 please click here. RouterBoard (RB411U/RB411UHR) can be configured to monitor the Sierra Wireless MC87xx built-in GPS feature. Where channel=2 is NMEA channel assigned for GPS data.